Slow-growing tumors may be better managed with active surveillance, closely monitoring any progression, than with more invasive measures. For most men diagnosed with prostate cancer, it's a slow-growing disease and may require for treatment an active surveillance rather than more radical procedures. Doctor consultations will spell out the various options. For some men, prostate cancer can be an aggressive disease, but for most, the disease is slow growing—in fact, men with prostate cancer are more likely to die with it than from it. Even so, a recent study (Journal of Urology, February 2017) suggests that the anxiety many men experience after being diagnosed with prostate cancer may lead them to choose potentially unnecessary treatments even if their cancer is considered low-risk. Prostate cancer initially remains confined to the prostate gland (a small walnut-sized gland that surrounds the neck of the bladder and urethra). The cancer may cause few or no symptoms in its early stages, and this means that it may not need treatment at all, particularly in older men or those with other medical comorbidities. “For these men, active surveillance—in which the cancer’s progression is regularly monitored with blood tests, rectal exams, magnetic resonance imaging, and repeat biopsies—is an option,” says Reza Mehrazin, MD, assistant professor of urology at Mount Sinai. If prostate specific antigen (PSA, a marker for prostate cancer) levels rise suddenly, or the biopsy suggests the cancer is becoming more aggressive, your doctor may suggest surgery or radiation therapy. “A surgical procedure called radical prostatectomy removes the prostate gland and the nearby lymph nodes,” Dr. Mehrazin explains. If active surveillance indicates that your cancer is spreading, surgery or radiation may be suggested. If the cancer spreads beyond the prostate, you’ll be given hormone therapy: drugs that block production of the hormone testosterone, which fuels the growth of prostate cancer. Do I need any other tests before deciding on treatment? Is active surveillance an option for me? If I need other treatment, what are the options? What risks or side effects may occur with each treatment option? How likely is my cancer to affect my health and cause suffering if I’m not treated immediately? The study we reference above included 1,531 men with newly diagnosed prostate cancer that was clinically localized (which means the disease had not spread to other parts of the body). The researchers measured the participants’ emotional distress with a standard scale that ranges from a score of zero (indicating no distress) to 10 (extreme distress). The men were assessed after their diagnosis and again as soon as they had made their treatment decision. The majority of study participants had either low- or intermediate-risk disease for which active surveillance is a clinically viable treatment option—however, most chose surgery, followed by radiation and, lastly, active surveillance. The level of emotional distress after diagnosis predicted a greater likelihood of choosing surgery. It’s natural to feel distressed after a cancer diagnosis, but anxiety may be heightened in older adults who remember a time when all cancers were considered a death sentence. However, while prostate cancer is a major disease, it isn’t necessarily a lethal one. “The prostates of most older men, at autopsy, are found to contain prostate cancer even though they had no signs of the disease during their lives,” Dr. Mehrazin notes. Among men who are diagnosed, the five-year survival rate is 99 percent—and the ACS estimates that there are nearly three million prostate cancer survivors in the U.S. “Many men live for years on an active surveillance regime without their cancer progressing enough to need treatment,” Dr. Mehrazin emphasizes. In one 2016 study, prostate cancer-specific mortality was low after 10 years of follow-up irrespective of the treatment used. A 2015 study found that 40 percent of men with prostate cancer who chose active surveillance had not needed surgery by 10 years after diagnosis. If you are diagnosed with prostate cancer, Dr. Mehrazin advises that you be open with your doctor about any distress you feel. “It will be helpful for your doctor to understand what may be influencing your decisions, and to address negative motivators such as emotional distress to prevent you from receiving a treatment you don’t need or may regret later,” he concludes. 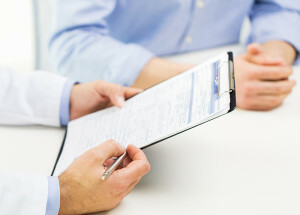 In 2012, the U.S. Preventive Services Task Force (USPSTF) recommended against routine prostate cancer screening because it considered that the potential harms of treatment after an abnormal PSA test outweighed the benefits of testing. Generally, men with high PSA levels are at greater risk for prostate cancer—however, PSA levels also can be influenced by non-cancerous conditions, such as an enlarged prostate. 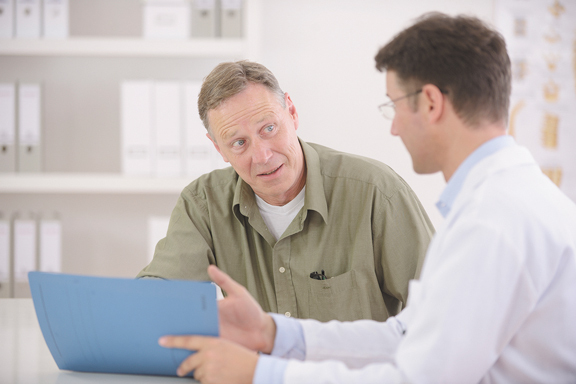 Men who test high for PSA often have further tests, including biopsies. If cancer is diagnosed, many men opt for aggressive treatment—and suffer side effects immediately afterwards, even though it might have been 10 to 20 years before their cancer caused symptoms. Research suggests that the USPSTF guidelines have reduced the overdiagnosis and overtreatment of low-risk prostate cancer. However, there also has been an increase in the number of cases of advanced prostate cancer since the guidelines were issued—and some experts contend that the rise may be due to the fact fewer men are being screened. If you’re considering screening, discuss the harms and benefits with your doctor before making your decision. Keep in mind too that because prostate cancer grows slowly, it can take 10 to 15 years to see the benefits of testing. If you likely have a lower life expectancy than this, you might want to skip the test. abnormal psa, active surveillance, advanced prostate cancer, anxiety, blood pressure, cancer, cancer cells, cancer diagnosis, cancer screening, cancer survivors, cancer treatment, cancer treatment options, cancers, diabetes, external beam radiation, health, heart disease, high blood pressure, high blood pressure and, high psa, high psa levels, hormone, Incontinence, low risk prostate cancer, mortality, most common cancer, osteoporosis, Prostate, prostate cancer, prostate cancer levels, prostate cancer screening, prostate cancer treatment, prostate cancer treatment options, prostate gland, prostate radiation, prostate specific antigen, prostatectomy, psa, psa levels, psa test, radiation, radiation therapy, radical prostatectomy, recovery, side effects, skin, skin cancer, testosterone, tumor.